This post comes a little late, mostly because I was out almost all weekend, and then I got sick with a nasty bout of stomach flu last Monday. And then the blog silence, I really have no excuse other than I was busy for most of February with trips, and reading, and writing. So yeah, I am letting myself off the hook for the blog silence. We all should do that for ourselves, right? Anyway, so February. 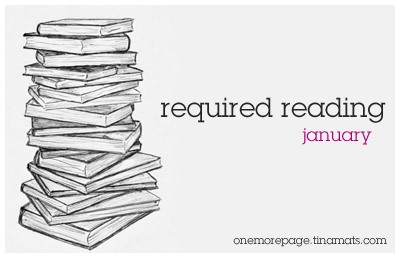 If January was such a good month for all the books I said I’d read…on February, I didn’t finish anything. Is Everyone Hanging Out Without Me? by Mindy Kaling (3/5) – What a laugh-out-loud read. I want to be friends with Mindy Kaling. Quicksilver by RJ Anderson (4/5) – I really liked Ultraviolet, and I’ve had its sequel in my Kindle for the longest time before I finally got around to reading it. It was a little confusing at first because I forgot the events of the first book, but after a while I got into the groove, and wow, this one was just as explosive as the first one. This Song Will Save Your Life by Leila Sales (4/5) – I picked this up randomly while I was on my trip to Cagayan de Oro. I was surprised that I read through it so fast. It’s good, and I thought it was a light, feel-good novel but it’s not. Not so much, anyway. I think I’m going to really add Leila Sales to my list of must-read contemporary YA authors. See, it wasn’t a bad reading month. Just that I didn’t follow my reading plan. It happens, right? March is my favorite month, so normally I would pick books that I really want to read — books from favorite authors, books I’ve heard good stuff about but reserved it on my shelf for the reading slump days. I had a partial list of books ready for this month, like The Lost Lake by Sarah Addison Allen, More Than This by Patrick Ness, and The Woman Who Died A Lot by Jasper Fforde. 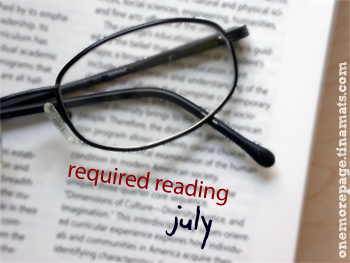 But when I was composing this post in my head earlier, I realized that if I was enjoying just picking up whatever book I want to read from my TBR pile, even if it’s not the book I said I’d read for the month. 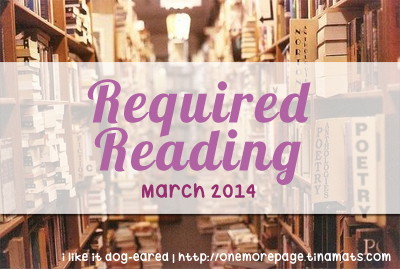 And with that, I decided: I will not have a Required Reading list for March. A decade in the future, humanity thrives in the absence of sickness and disease. But these parasites are getting restless. They want their own lives…and will do anything to get them. 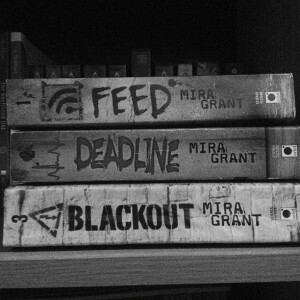 Mira Grant is back, and she’s not writing about zombies. This time around, she’s writing about worms — tapeworms, to be exact. Genetically engineered parasites that everyone in a future world has, that somehow keeps the world healthy. It seems impossible, but SymboGen Corporation made it so, and everyone in the world has those tapeworms that they try to keep healthy. Even Sally Mitchell, a girl who survived a freak accident. She was almost dead, but suddenly, she’s alive, with no memory of her old self. She’s considered a SymboGen miracle, and she tries to live her life as normally as she can while she tries to live a new life from the old Sally that everyone knows. But it’s not so easy, especially when people are starting to have a sleeping sickness, the kind where people start to shamble like…well, zombies. And they’re getting violent. And somehow, they’re always all around Sally. So Parasite got me excited because this is Mira Grant, the woman who wrote my most favorite zombie series so far. When I started reading this, I kind of felt bad that she wasn’t writing about Shaun and Georgia and the rest of the Newsflesh gang, but I was excited to dive into this new world that she wrote. As with Feed, Parasite‘s world-building is very detailed, so much that I felt that if I tried to look for research about the SymboGen implants, I felt that I would find some. The articles and the passages inserted in between read like real ones, and I actually read them instead of just ignoring them (like I do sometimes), so I can get into the story. Sally/Sal reminded me a little bit like Georgia, but less of the bad-assery that the latter had. I liked her, because she seemed like a genuinely nice person, albeit a little confused. But it’s understandable given her predicament. I liked her family, too, even if it felt a little strange that they seem to be all high-profile ones. Truth be told, almost all the characters in this book seemed to be different shades of gray — I’m not sure who’s really a good guy or if they’re somehow a part of the bad group or something. The only person I was convinced was on Sal’s side was Nathan, her boyfriend, but then sometimes I don’t feel that too much, either. Overall, though, I liked Parasite. As always, there was a time when I truly worried for the characters, and I really wanted to get to the bottom of the story. Of course, since this is a part of the series, I didn’t get most of the answers I wanted because they will be revealed in the next books. My prediction did come true, though, and I saw it coming the moment it was explained in the book. I won’t say what it is, but it’s definitely kind of…well, surreal and again, WTF?! 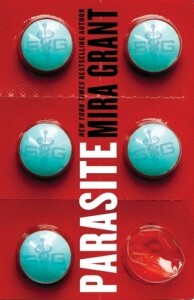 If you’re a fan of Mira Grant’s Newsflesh trilogy, Parasite may be a hit or miss, depending on how attached you were to the former. I liked Parasite, though, even if I terribly missed my zombies. But there were some kind of zombies in this book anyway. Not quite the zombies I know, but I’ll take it anyway. If you’re into medical science fiction (is my term correct? ), then you will probably enjoy Parasite. Now the next question is: will you ever agree to have a tapeworm inside you if it would make you live longer? After all, what’s the point of helping create an apocalypse if you’re not going to be around to see it? Fahrenheit 451 is set in a grim alternate-future setting ruled by a tyrannical government in which firemen as we understand them no longer exist: Here, firemen don’t douse fires, they ignite them. And they do this specifically in homes that house the most evil of evils: books. Books are illegal in Bradbury’s world, but books are not what his fictional — yet extremely plausible — government fears: They fear the knowledge one pulls from books. Through the government’s incessant preaching, the inhabitants of this place have come to loathe books and fear those who keep and attempt to read them. They see such people as eccentric, dangerous, and threatening to the tranquility of their state. But one day a fireman named Montag meets a young girl who demonstrates to him the beauty of books, of knowledge, of conceiving and sharing ideas; she wakes him up, changing his life forever. When Montag’s previously held ideology comes crashing down around him, he is forced to reconsider the meaning of his existence and the part he plays. After Montag discovers that “all isn’t well with the world,” he sets out to make things right. There were several times when my bookish friends and I would joke around about burning some books that we don’t like, especially that vampire series that just doesn’t seem to want to die (or well, I think other books are replacing it now?). It’s really all just a joke, because for the life of me, I can’t imagine myself burning a book, no matter how much I disliked/hated it. I remember this one time where I heard of a book being torn in front of some people in school — some hater getting at it at the face of the authors — and even if I didn’t witness it first hand, my heart hurt just a little bit at the thought of a book being damaged like that. in Ray Bradbury’s Fahrenheit 451, doing such things to books are a commonplace. Books are illegal, and firemen go around hunting for books (and houses of books) to burn. Everyone’s focused on television and other seemingly mindless things, and anyone who thinks otherwise are considered dangerous. Guy Montag is a fireman, and he has lived with burning books, until he meets his neighbor, Clarisse. Clarisse makes him ask questions about his life — his wife, his job and all the question about books. He slowly realizes that maybe his life wasn’t really what he wanted it to be and sets out to do something about it. It’s been a while since I read a dystopian book, so it took me a while to adjust to Fahrenheit 451‘s world. Since I was listening to this on audio, it took me an even longer time to really get into it. I liked the premise of the book, and as a book lover, Montag’s world felt depressing. I didn’t want that, and when I got to the chapter where Montag and his firemen buddies burned a house of books, I was wincing all the time. Ack. Perhaps there’s also something about the way Bradbury writes (and how the book was narrated) — the rhythm of his words felt almost hypnotic. I suppose it helped that I listened to the audiobook, because I thought the narrator had a very fitting voice for the story. I liked Fahrenheit 451, and I think that it’s still quite relevant now. Bradbury wrote this book as a statement about how “…television destroys interest in reading literature,” and while that is still true, I think that there’s another competition that’s really taking everyone’s interest: internet. I mentioned during our book discussion how everyone’s so attached to being online now — myself included. I remember reading this story about the mom who gave his teenage son an iPhone for Christmas but with a contract, and this particular line in the contract got to me: Turn it off, silence it, put it away in public. Especially in a restaurant, at the movies, or while speaking with another human being. You are not a rude person; do not allow the iPhone to change that. (Source) I’m very guilty of this, and I’m trying to get rid of this habit, and I realized that our attachment to our smart phones and internet is another way for us to lose interest in reading. I mean, I haven’t lost interest yet, but how many times have I ended up playing with my phone, going online in all my social media accounts on the times I said I would be reading? How many times have I chosen tweeting over making an effort to make actual conversation? Those kinds of things. It’s a bit disconcerting to think about it, but I guess that’s the point of this book, anyway. It’s definitely something to think about. 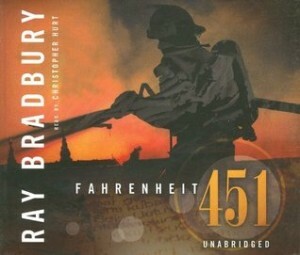 I just wished there was more to Fahrenheit 451‘s ending. I wished there was more to know about the people who memorized books so no one would ever forget them, and that it didn’t simply feel like an afterthought to the story. The ending kind of reminded me of The Giver — a bit open-ended, but good enough to leave the reader asking some questions. Especially questions like, If I can only memorize one book and one book alone, which would I pick? I do not have an answer to that question. Do you? They are monsters of the past, remnants of primitive fantasies. They are hallucinations, creations of modern science fiction. Evidence unearth is debunked…or disappears. Witnesses who speak are ridiculed…or silenced. We are alone, say our leaders. There are no Manananggal that consume our children. There are no Kapres who watch in the night. There are no aliens that abduct our neighbors. There are no UFOs with dazzling lights. These are not your Lola’s monsters. These are not your children’s aliens. They are one and the same. They are here. You know how I said that I probably would not drop by Komikon if the Trese 5 release wasn’t announced? I take it back — I realize that I would have probably gone there anyway, just to support Paolo‘s newest release, Mythspace. It’s not that I did not know about his newest project. I heard of it, but I was too busy in the past weeks before Komikon to check the Mythspace Monday posts he had up on his blog leading to the release. In a way that is a blessing in disguise, because now that I’ve read the sampler they released last Komikon, I’m catching up on the posts which I hope will tide me over until Mythspace fully launches. What is Mythspace, anyway? Pao talks about it in detail in this post, but if you want the quick, one-line summary: Mythspace is what happens when Philippine folklore meets science fiction, specifically aliens. This new series plays on the idea that the creatures we know from folk tales and movies not simply monsters from our grandparents’ stories, but you know, creatures from outer space. Sounds crazy, yes? But you know what? It actually works. 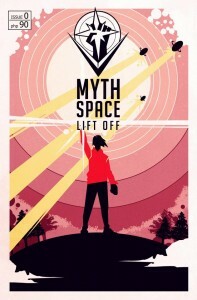 Mythspace #0 is the preview issue for the science fiction anthology. Here we can read a bit of two stories from the anthology, as well as preview of the art from the different illustrators: Koi Carreon, Borg Sinaban, Jules Gregorio, Mico Dimagiba, Cristina Rose Chua, Paul Quiroga. I’m not a good judge of art, but I liked that each story seemed to have its own personality because of the artist. I also liked reading the previews for the two longest stories there, with Liftoff having that mystery-in-space type of story with a somewhat angst-ridden hero, and Unfurling of Wings reminding me so much of the chimaera world in Laini Taylor’s Daughter of Smoke and Bone. There’s also a bit of information on the aliens we will meet in the issues. My favorites are the Kapre and the Manananggal – somehow, these versions are less scary than what I heard from stories growing up. The year was 2039. The world didn’t end when the zombies came, it just got worse. Georgia and Shaun Mason set out on the biggest story of their generation. The uncovered the biggest conspiracy since the Rising and realized that to tell the truth, sacrifices have to be made. Warning: This may not end up as a review, but a very fan-girly love letter to the trilogy. Also, spoiler free. So normally I would have written a review for this book as soon as I finished it, but with my record of reviewing books lately, I took my time. In all honesty, I can’t remember parts of the book anymore, but I remember that sad feeling I got when I finally arrived at the end of this amazing trilogy. So three years ago, I stumbled upon Feed by accident, and I only really wanted the book because I judged it from its cover the moment I saw it. Little did I know that this would spark a love affair between me and the After the End times staff, with Georgia and Shaun Mason and Buffy and Mahir and Becks and Maggie and Alaric and everyone who’s ever been a part of this series. Yes, that includes other fans who I have met and virtually squealed with and liked reading updates and shared speculations with over and over again. Let me back up a little: for the uninitiated, Blackoutis the third book in the Newsflesh trilogy, where we readers follow the After the End times staff with uncovering a humongous conspiracy that could very well mean the death of human civilization as they know it. With zombies around, it’s easy to imagine how it could end, especially with how Deadline ended. But of course, there’s more going on without the team’s knowledge and when these things finally collided, well…it was pretty explosive. Blackout is one of my most awaited books this year, and I waited a little bit before I actually read it because I just didn’t want it to end yet. 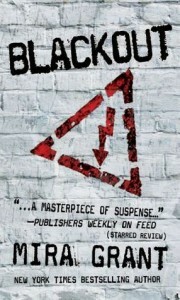 Granted, Blackoutis probably the weakest among the three books. But by weak, I don’t mean that it sucked — it was just not as engaging as Feed or as mind-blowing as Deadline was, but there were still so many feelings that came and went at the reading of this book. But here’s the thing: I love the characters and the series so much already that I can’t not love this book. I can’t not love its finale, for all its faults and awesome things, for all the emotions and fist shaking it brought. I felt like I’ve invested so much in this series that I can’t not love even this book. I have fangirled in this review so I’m afraid this review of this particular book may not be as helpful as the others, but if you feel like picking up the series, then consider this review as my own version of pushing it to you. I am very, very happy that I stumbled upon Feed years ago, because somehow it made me feel like I’m a part of this series ever since its first release. I’m not an expert on the genre, but this is definitely one of the best zombie books I’ve read in a while. It is with a sad heart that I said goodbye to all these characters, and I will miss them all terribly…but I’m pretty happy with how this ended. We started as a news site. 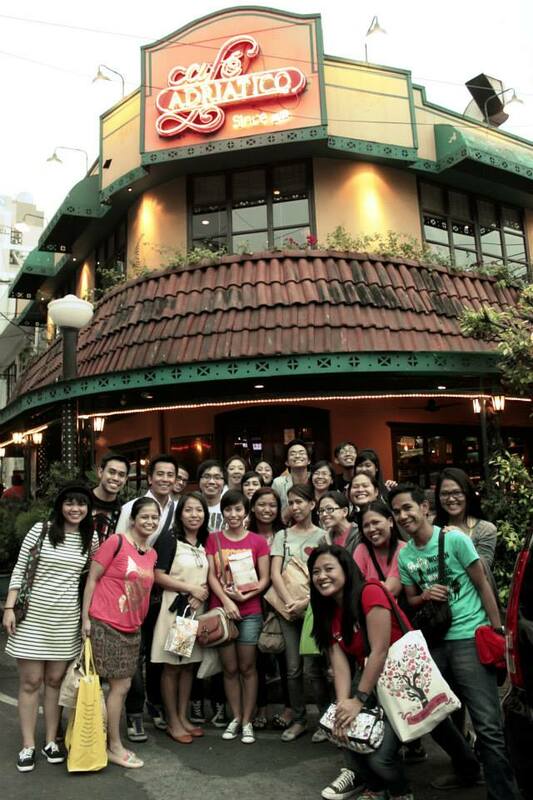 Somewhere along the line, we became a family. Rise up while you can.